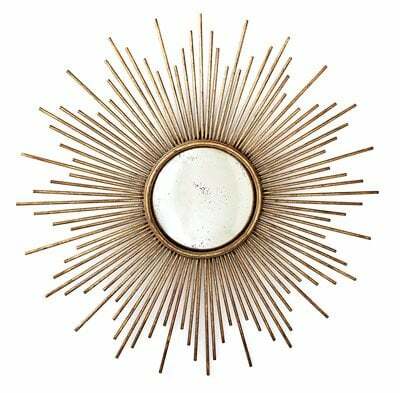 A sunburst mirror is a brooch for a room. I love sunburst mirrors! Over a fireplace or on a wall or bed head, they live somewhere between wall decor and functional art. 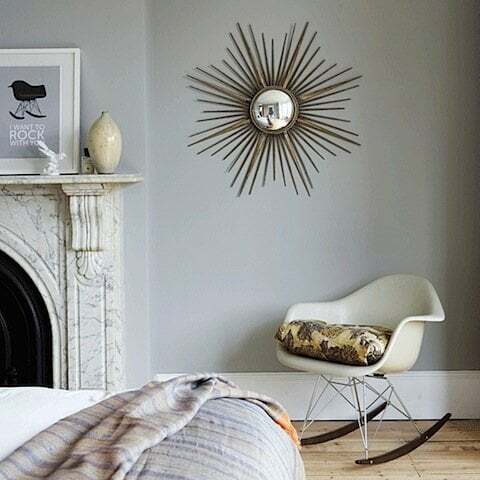 Design trends come and go but the sunburst mirror is a classic. A motif of emanating rays made from antique gold, bronze, painted chopsticks or ancient driftwood around a circular mirror has been associated with Louis XIV or the Sun King, and has been wall decor for centuries. It skips right past design trends into the realm of classic functional art with its rich sweeping arms up high in salutation. The Ever Stylish Sunburst Mirror article in the Online Wall Street Journal goes into the history of this classic wall decor. Victoria Hagan, New York decorator to uptown clients, said she finds "sunburst mirrors add a happy touch, a sparkle, to any space, from the tiniest of powder rooms to the grandest of living rooms. I use them in unexpected ways, hanging them over another mirror, or above a piece of art in a small space, like a vestibule." Meanwhile, downtown decorator Miles Redd, who caters to the haute bohème set, said, "They can dress up a boring space. They bring a sense of architecture and reflective surface to a room. I love them hanging above a headboard on a canopy bed." As the article points out when bidders at Christie's and Sotheby's go wild for something, retailers like Target and Crate and Barrel are close behind with replicas, especially when the wall decor doubles up as functional art. It looks good and its practical .. that overrides design trends. Sunburst mirrors vary in price. 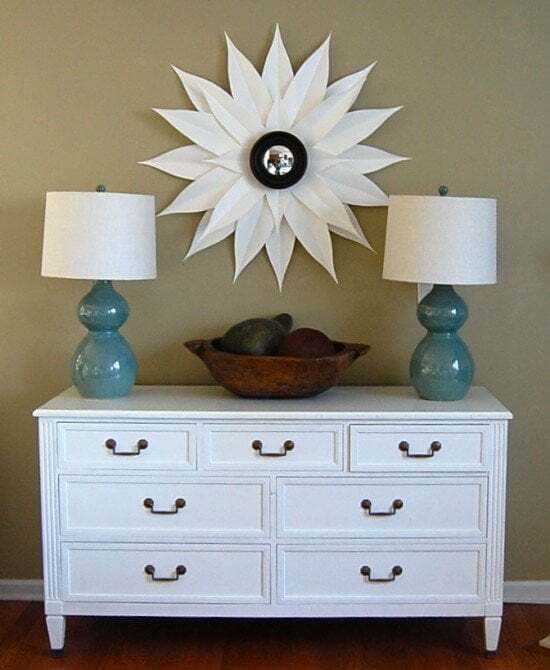 Here are a few different DIY articles on how to make your own functional art - in this case, a sunburst mirror. Shelterness have 21 Decorating Ideas Of Using Sunburst Mirrors where you can get some inspiration on what kind of mirror you like. There are so many design trends to look at, there is bound to be one you'll fall in love with. If you're ready to make your own mirrored wall decor then head to The Nester to make this white sunburst mirror in white poster board for less than $25! Chic and cheap functional art! Isabella and Max Rooms also have a great DIY sunburst mirrors project made from bamboo sticks. The bamboo sticks are painted white but could be easily made to look like antique gold, bright red or black depending on the design trends you might be following. The final tutorial is from Small Home Love. Bamboo skewers create this antique gold mirror. The method is a little different but the result is just as stunning. Don't forget to join our Free Email List here and get DIY Cheat Sheet and 42 Interior Decorating Secrets, weekly tips and newsletter.